Conveyor belt is the most important element of a belt conveyor installation. The conveyor belt fulfils the task of absorbing the stresses developed at the drive start up, transport the load, absorbs the impact energy at the loading point, withstand temperature and chemical effects (heat, oil and acidity etc.) and meet safety requirements (flame resistance and antistatic etc.). The selection of the conveyor belt specification depends on its application. The schematic cross section of a plied conveyor belt is shown in Fig.1. 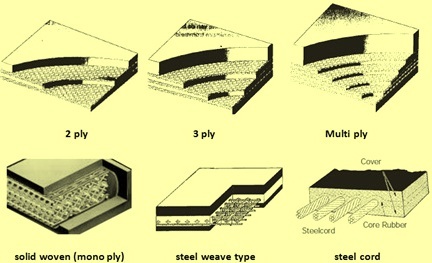 Conveyor belt has the following components. Carcase – It consists of textile plies, steel weave or steel cord. Additional components – These components of the conveyor belts are as needed and usually are edge protection, impact protection and longitudinal slitting prevention etc. Special construction elements – These are the profiles on steep incline belts, cleats, or corrugated edges etc. The carcase of a conveyor belt can be made from various materials and in different construction. The most commonly used are textile ply carcases and steel cord. Textile ply carcases are with one or more textile plies. The maximum numbers of plies can be up to 6 numbers. In monoply belts, a PVC impregnated textile carcase is used. Depending on tensile strength and duty, the carcase fibres are in polyester, polyamide or aramid. In the carcase of steel weave type, the transmission of force is by means of the longitudinal steel cords laid to one another in the same plane. Above this carcase is a transverse layer also of steel which is held in place by a polyamide binder cord. In carcase with steel cord, the belt force is transmitted via steel cords of the appropriate strength. Steel cords are transversely bound together by an intermediate layer of rubber only. Transverse elements serve to prevent impact damage or longitudinal slitting. The materials for textile, solid woven or steelreinforced types are natural fibre (cotton), synthetic fibres (polyamide, polyester, polester-polyamide and aramid), ferroflex (steel weave) and ST belt (steel cord). Different ttypes of carcases are shown in Fig 2. The carcase is protected against outside influences by the covers which are normally made out of either rubber or PVC. The carrying side cover should not be more than 3 times thicker than the running side cover, which means that the cover thickness ratio (Carrying side: Running side) is 3:1. With wholly synthetic and rot resistant plies it is not necessary to have heat sealed cut edges. Exception is belts requiring special qualities such as oil resistance. The basic grades and principal properties as per DIN 22102 and ISO 10247 standards are given in Tab 2. Specification of covers may include one or more of the special qualities such as flame resistant, anti static, flame resistant along with anti static, heat resistant, low temperature resistant, oil and grease resistant, food grade and chemical products grade etc. The carrying side surface depends on the load, the inclination of the installation or depending on the use of the belt, smooth, profiled, cleated and with corrugate dedges. The thickness of the carrying side cover depends upon the nature of the load and loading conditions (type of load, gradient and height of fall etc.). Based on the conditions the cover thickness on the carrying side can vary from 2 mm to 12 mm and that on the pulley side from 2 mm to 5 mm. Natural rubber – It is a good material for belt cover rubbers since it has a very good tensile strength and elongation, hih heat resistance and elasticty, high shear and tearing strength and good abrasion resistance characteristics. It is stable within th temperature range of -30 deg C to + 80 deg C. It is resistant to water, alcohol, acetone, dilute acids and alkalis. Styrene- Butadiene rubber – It is a synthetic polymerisation product consisting of styrene and buadiene whose charateristics of natural surface. Tensile and cut resistance are good. Abrasion, heat and oone resistance are better than natural rubber. Nitrile rubber – It is a copolymer of butadiene and acrylonitrile. It is not resistant to ketones, easters aromatics and hydrocarbons. The physical properties are slightly lower than those of natural rubber. The temperature operating range can be controlled between -40 deg C to +120 deg C. It is generally abrasion resistant, resistant to ageing and used for oil and grease resistant belt covers. Butyl rubber – It is a polymerization product of isobutylene and isoprene. It has a very good ozone and temperature resitance. It has a very good resistance to ageing. It is able to withstand temperatures of – 30 deg C to + 150 deg C. It has limited resistance to acids and alkalis. It is mainly used for heat resistant conveyoy belting. Ethylene – propylene- diene rubber- It is known as EPDM rubber. The temperature resistance of this rubber is similar to butyl but with a considerable higher resistance to wear and tear. It has also got a better oone resistance. Chloroprene rubber – It is a synthetic polymerization product of chlorobutadiene. The mechanical properties are similar to natural rubber but it is significantly better in respect of oone and oil resistance. Because of chlorine, chloroprene rubber has a high degree of flame resistance. The working temperature range is – 30 deg C to +80 deg C. Ageing resistance and oil resistance is better with this rubber.